Breaking into the adult labor force is hard. Doing so within the anime industry is darn brutal. Here we’ll discuss the different ways in P. A Works’ Shirobako and Diomedea’s currently airing Girlish Number present this idea and what we can take away from both..
An anime engaging in meta commentary towards its own genre/setting trappings is far from being a novel concept. One with boundless potential that mainly resorts to only using it to point out the existence of tropes rather than saying anything about said tropes and what happens when real world people try to embody them. The Fall 2016 season seems to have us an answer to this with the premiere of Girlish Number. A series that on the outside seems like little more than another series source of light fun depicting the world of cute young seiyuus through a rose-tinted anime-ish perspective. However, the fact that the original LN was penned by Wataru Watari of Yahari Ore no Seishun Love Comedy wa Seishun Love Comedy wa Machigatteiru (Oregairu) fame. 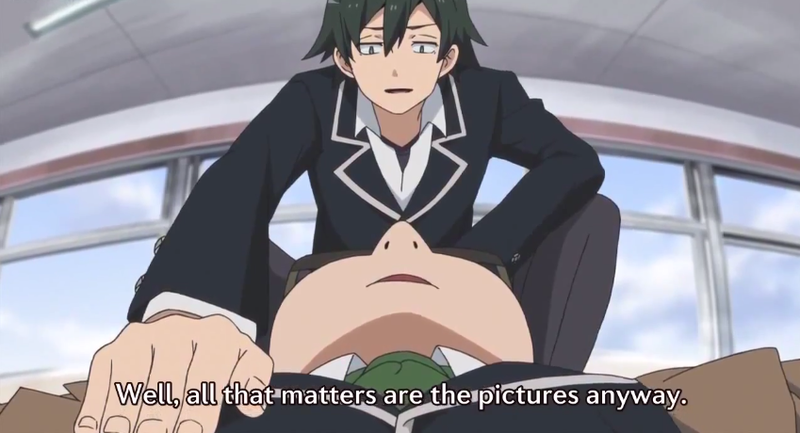 Oregairu also conveyed some tempered shots at Japan’s light novel industry, and it’s those sort of jabs that make up much of Girlish Number’s life blood. The series magnifies Wataru Watari’s sour outlook on the current state of light novels and where they intersect with anime in a setting that directly facilitates it in a natural way. His biting wit comes through as early as the 1st minute of episode 1. We open with the final minutes fan greeting event. On stage are the various seiyuus one by one giving final thoughts on a recently finished production to fans that utterly reek of canned cheerfulness as opposed anything remotely resembling some kind of genuine emotion.The illusion of the industry is shattered the moment we are introduced to Chitose, our protagonist mere seconds into episode 1. Girlish Number doesn’t show much interest in piecing it back together. The result of such well-placed and honest cynicism is that it’s sort of hard to root for anyone at first. They all seemed like cogs in an inherently broken machine that peddles carbon copies of previous works that no one ever remembers past the season in which they aired most of the time. This is where the major difference between Girlish Number’s perspective on the anime industry and the generally more uplifting Shirobako comes in. 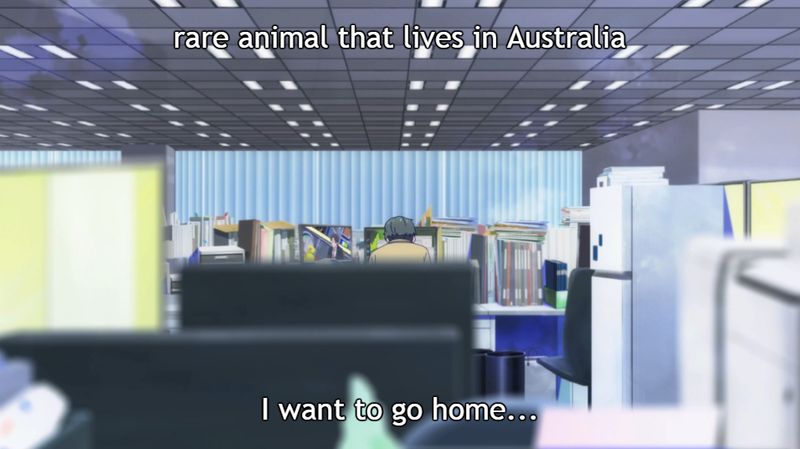 With Shirobako, whilst it does a fine job of detailing the intense pressure that animators, seiyuu, directors, and production assistants, it balances out whatever harsh cynicism it doles, with the positive outlooks of its characters and their strong desire to be a part of something they actually believe has artistic merit. Whilst financial success is obviously the life blood of any industry, the ability to take pride in whatever one does is the ultimate sign of a well-chosen career path. 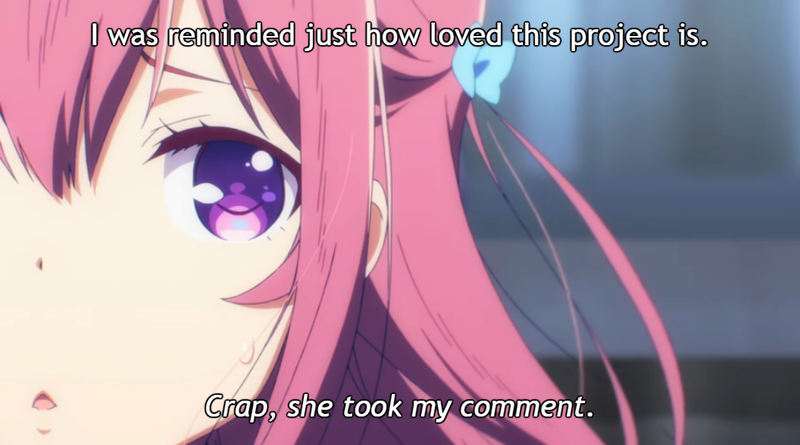 Whilst the production team in Girlish Number are perfectly fine with churning out the bare minimum of what any otaku might spend their money on, I never quite got the same feeling from anyone in Shirobako. The crew over Musashino Productions throughout the first half of the series pour all of their effort into something distinct. A pet-project by the name of Exodus that their director, Seiichi Kinoshita, looks at as his act at redemption for a previous project that ended up being a horribly animated flop of a fanservice title that had critical reception that was as unrelentingly ugly as the work itself. 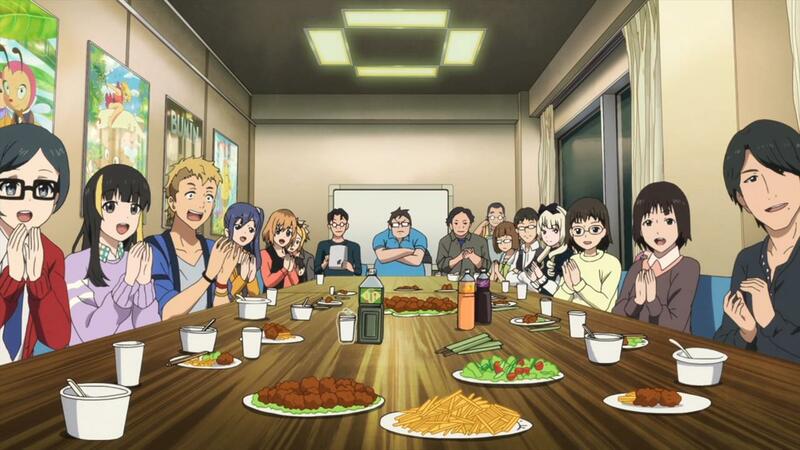 It’s this kind of passion that makes us want to root for the cast of Shirobako. We want to see them get through the difficulties of collaborating with other creative individuals. We want to see the animators get in their required amount of cuts approved just in time for their insane deadlines. We want to see Zuka have her big breakthrough as the result of her talent. We want to see Kinoshita find the inspiration needed to complete his storyboards with enough time to put them in motion before broadcast. In short, we want to see them succeed on the basis that we all want to see the world as a place were decent people will get the appropriate gratification for their struggles, even if that’s a lie. The gulf between the daily grind and our wildest aspirations is one that’s in constant threat of being derailed by things that our out of our hands or tough personal habits to break. Whether having to deal with procrastinating key animators, a director that would turn down key animations during the dubbing process, or simply not being skilled enough to meet demands, the possibilities for setbacks are endless in the world of animation. That said, their just isn’t any time for bitterness in the workplace, something demonstrated when we’re introduced to Daisuke Hiraoka in the latter half of the series. His lack of communication alongside his jaded, standoffish nature from years of underachievement and having his passion worn down by the corporate grindstone ends up being more of an obstacle than anything else. In such a case, approaching a task with a pout is as bad, or perhaps even worse, than giving up entirely. Building a network of healthy relationships is what makes such momentous tasks feel a little less impossible. Girlish Number’s core appeal however, whilst a stark contrast compared to Shirobako’s, is still plenty interesting in its own right. The question is less “will these characters succeed?” and more “how many failures/embarrassments will it take for these characters to start improving?”. 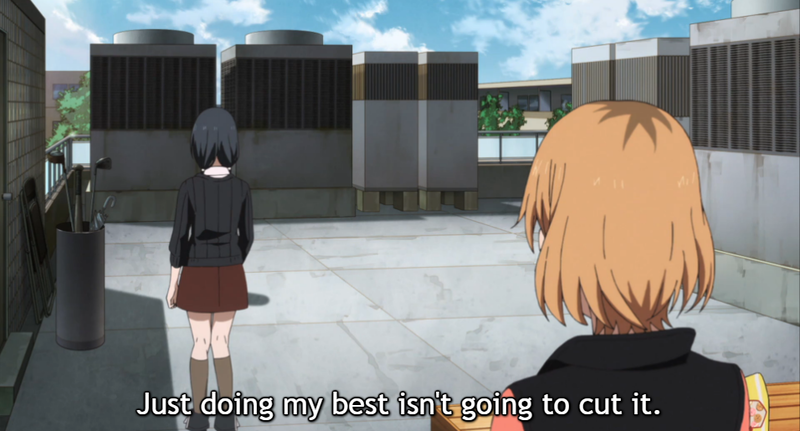 Shirobako was all about putting all of its characters through the intense stress and disillusionment that comes with the reality of their jobs and witnessing how they just barely flounder their way to success (at best). Girlish Number puts the various seiyuus that make up the main cast into a situation that values functionality over distinct voices. The world that they’re a part of is complacent, by the numbers, and doesn’t look to be changing any time soon. The sort of business model that encapsulates the most cynical assessment modern anime as a whole, where no one actually likes this thing they’ve become a part of. The thing is, we don’t want to see Chitose succeed, as the type of attitude she exhibits is far more prone to failure. She only became a seiyuu in the first place to gain an audience that would shower praises on her and has little regard or knowledge towards anything else that comes with the job. Yet despite all that, carries herself in a way that gives off an thick fog of unearned confidence. The only reason for how such arrogance could ever persist in such a competitive environment is through her complete and utter lack of self-awareness. 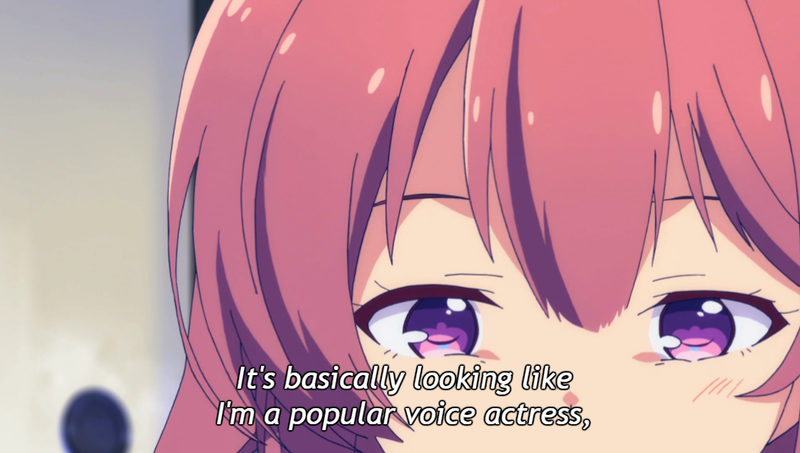 Chitose gets by on lying to herself by both believing that she’s come a lot farther as a seiyuu than she actually has and that she got where she is through her own talent. Not to mention, she’s the type of person that would take an inch of positive reinforcement and take a mile long ego trip. A reality check would inform her she only got a lead role for simply being cute and having good connections and that said cuteness is the both the beginning and end to her appeal. That said, the world she’s become a part of is one that isn’t always one that’s quick to undercut her sense of entitled hubris, but when it does, boy does it sting. When recording her awful acting in the 3rd episode for example, the sound director stops at only timidly asking her for “a bit more” as if anything that she’s done all day is remotely close to what could even be considered standard for voice acting. 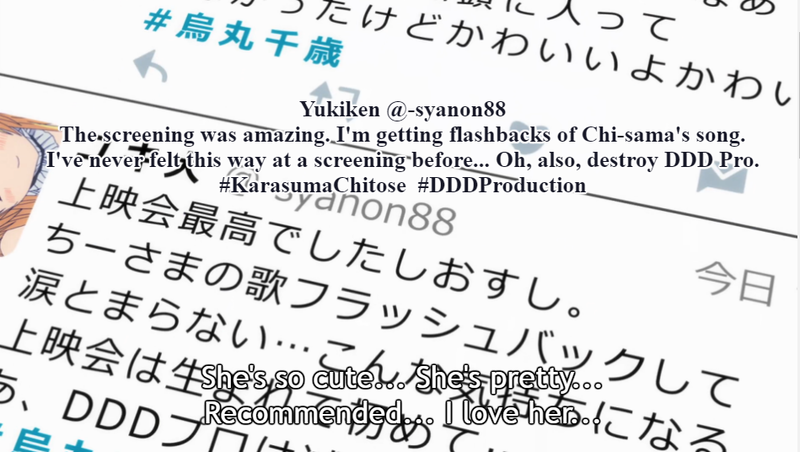 Whilst the production staff enables her to turn in mediocrity without question, the best Chitose can hope for is to seek out the sort validation that will keep her ego insulated within her own delusions. I can’t entirely blame a girl like Chitose for not being as gung-ho about what her first breakout role considering that she’s got a textbook tsundere lead to work with. Regardless however, there’s no excuse for her not taking the actual art of voice acting as seriously. Her more experienced co-stars Momoka and Kazuha are able to see all the same warts that come with the job and then some, but that doesn’t serve as an excuse to neglect what she’s primarily being paid for and executing on their craft as best as they can. Although decent when it comes to keeping composure during staged events, there’s more to building a strong personal brand than just “fake it till you make it” after all. There’s no replacement for proper talent/skill. The fact that two highly resonant pieces of work like these can come from such an overworked and underpaid workforce is something that we consumers can take solace in at the very least.